Achieve a whiter, brighter smile today! Thinking of wanting whiter teeth? Have you got a Christmas function or party coming up? Have you got a friend’s birthday party just around the corner? Are you off to the races or festival? Look no further! At Emerald Dental Care, instant whiter results can be achieved within one single appointment. It is not surprising why teeth whitening is one of our most popular cosmetic treatment. Our teeth whitening treatments are completely safe, non-invasive and simple, so you know you’re in good hands. Whitening uses a peroxide gel, which restores your natural tooth color by breaking down discolorations caused over time by staining, aging or chemical damage. Whitening is completely safe and does not damage tooth enamel. The entire procedure can be completed in approximately one hour (including a dental assessment and preparation). Our dentists will protect your lips, cheeks and gums then apply a concentrated peroxide gel to the enamel of your teeth only. This method is very popular because of the quick and instant results. You can instantly achieve a whiter, brighter smile in one session! For those who are busy and do not want to spend more than an hour on the dental chair, our dentists also offer Take-Home Whitening Kits which can be done in the comfort of your own home. Our take-home kits are non-invasive and are very easy to use. Impressions are taken of your teeth and whitening trays are fabricated to fit your teeth exactly. The whitening solution can be applied onto the custom-fitted trays, which are worn 30-45 minutes per day over several consecutive days. Results are more gradual and length of use will vary depending on your desired result, hence you have full control of the procedure. Are you ready to brighten up your smile? 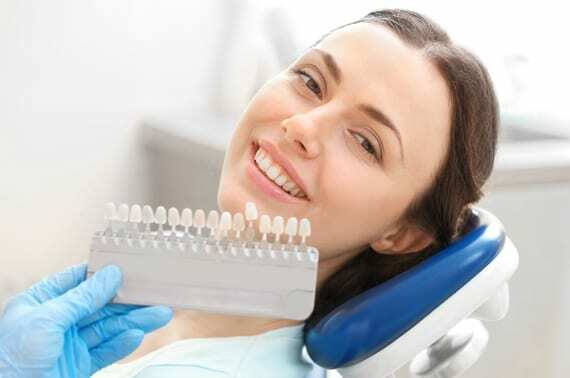 Prior to any teeth whitening procedure, our dentists will perform a thorough assessment of your teeth and gums to confirm suitability for the treatment. In some cases, where damage and staining is more extensive, crowns or veneers may be the best treatment but our experienced dentists will surely give you all the options. Book an appointment with one of our qualified dentist to see if you can benefit from whiter teeth today and start smiling with confidence! Bring a friend along and both can receive 20% off in-chair teeth whitening!